We are ready to realize projects of sports grounds for beach sports and also for soccer, volleyball, basketball, big and table tennis, workout and group sessions. We are able to develop individual projects adapted to inquiries of our customer along with ready-made solutions. One of the main activities of the company is design and construction of open sports grounds for beach sports. There are fields for professional beach volleyball at VDNH, in Gorky Park, in Lefortovo Park among our projects. We make turn-key projects developing and realizing convenient and practical infrastructure for athletes. We will make a project quickly and professionally. We will construct a sports ground for workout. 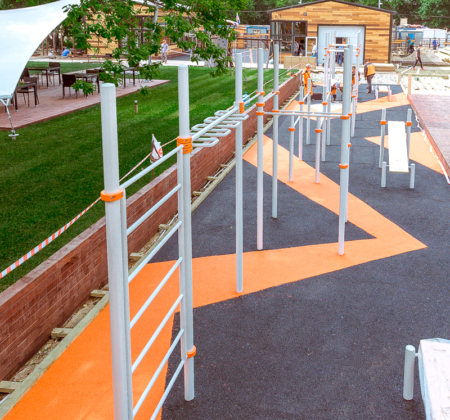 We’ll equip it with heavy-duty modern exercise machines, horizontal bars, the Swedish walls, bars, ladders and other constructions for gymnastics and sport in the open air. Since 2015 we are engaged in design and construction of sports grounds in the territory of beach sport and recreation complex Port at VDNH. Four spacious fields for playing beach volleyball (size 18х9) which can be transformed to the field for beach soccer and rugby are located there.